"This recipe not only makes the best pumpkin pie, but it's oh so easy too! Serve with whipped topping." In a large mixing bowl, stir together white sugar, brown sugar, salt, and cinnamon. When these ingredients are well mixed, stir in the eggs followed by the pumpkin and milk. Transfer mixture to the pie crust. 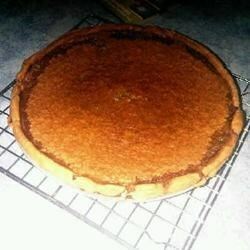 Bake at 350 degrees F (175 degrees C) for 1 1/2 hours, or until a toothpick inserted into the pie comes out clean. Cool before serving. This pie was great. It was very simple, I had everything I needed on hand. I did use 2 tsps. of pumpkin pie spice instead of the cinnamon. It was really one of the best pies I've made.